With fundraising, the sky really is the limit. Anything from a sponsored skydive to shopping via a fundraising site, there is something that everyone can do to help out and make such a difference to each and every one of our rescue dogs, the places where they come from and the families they go to. Here are a few ideas, but if you already have anything in mind let us know! The Easy Fundraising site allows you to shop online as normal at just about every major online store, and makes the retailer donate a percentage of what you spend to your favourite charity (Oakwood Dog Rescue!) It is easy to register and just search for your usual online shops using the search bar, click the link which directs you to the store and continue shopping as normal. It costs you nothing more than you would normally spend, and donates funds to us! When first visiting smile.amazon.co.uk, you will be prompted to select a charitable organisation. Amazon will give 0.5% of the net purchase price (excluding VAT and other shipping fees) of eligible AmazonSmile purchases to Oakwood Dog Rescue if you select us. It all works exactly the same as the normal amazon site but this way we get a percentage donated to us without any cost to you! Fancy running the London Marathon? Or how about the Great North Run? Ever wanted to skydive or bungee jump? Or a comical pyjama day at work or school? We will always support and promote you in anything you would like to get sponsored for in aid of the rescue. All sponsorship forms and leaflets about the rescue can be supplied. To continue running the rescue we depend entirely on donations and fundraisers. We appreciate any amount you can afford to donate (even just 50p!). You can use either the Total Giving Donate Button OR the PayPal Donate Button. You can also donate via text. Text OWVB99 followed by £1, £2, £3, £4, £5 or £10 to 70070 to donate. We are always involved in competitions to win donations, funds or useful services. If you spot any online or anywhere else that we could get involved in please just give us a shout. If you see any competitions we are entered in, please support us with a vote. 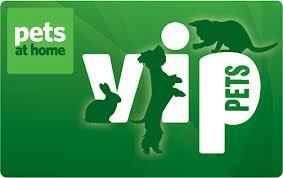 Pets at Home have launched their new VIP membership scheme. It works like your Tesco Clubcard, you get exclusive deals (like 10% off voucher for signing up or £1.50 off pet food) the card earns you points for your chosen charity based on how much you spend. The points are turned into funds and sent to us - it's a win-win! The card now also applies to anything you spend at Vets4Pets or Companion Care Vets! We hold street collections and go to events all over Hull and the surrounding areas every week. We are always needing volunteers to hold the rescue dogs, hand out leaflets and collect donations on these collections. If you can help out for just 1 hour or the whole day, your help will be much appreciated. To offer your time, please just message us on Facebook, email or call us on 01482 823555.